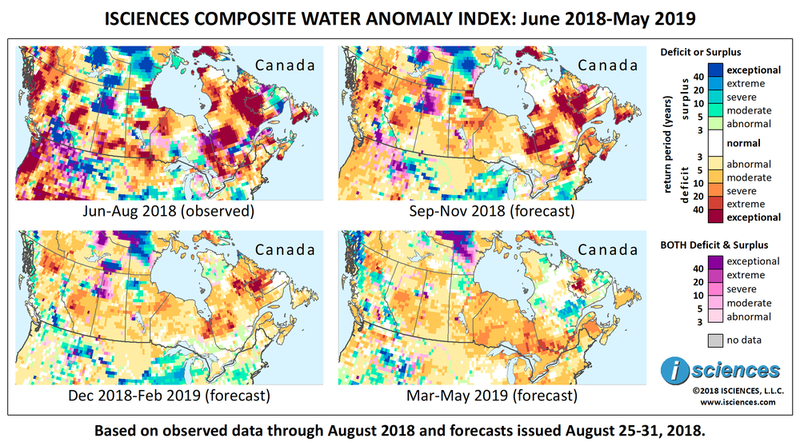 The 12-month outlook for Canada through May 2019 indicates large pockets of intense water deficit in every province and large pockets of intense surplus in southern British Columbia and northwestern Saskatchewan into Alberta. Intense deficits are forecast to encompass vast blocks in: eastern Quebec from the Caniapiscau Reservoir to the Gulf of St. Lawrence; around Lake Mistassini in central Quebec; Ontario’s eastern border; northeastern Manitoba along Hudson Bay, in the center of the province north of Lake Winnipeg, and in the southeastern corner surrounding the city of Winnipeg; southern Saskatchewan; the Upper and Middle Athabasca and Lower Peace River regions of Alberta; surrounding Prince George, British Columbia and in the northwest. Exceptional surplus conditions are expected in northwestern Saskatchewan around Churchill Lake westward to Fort McMurray, Alberta; and pockets in southeastern British Columbia. The forecast through November indicates persistent blocks of exceptional deficit conditions in the eastern half of the country, particularly: along the northern Ontario/Quebec border leading east to Lake Mistassini in Quebec; eastern Quebec from the Caniapiscau Reservoir to the Gulf of St. Lawrence; the triangle formed by the city of Quebec to Sherbrooke to Montreal; western Labrador encompassing the Smallwood Reservoir; Newfoundland; and southern Nova Scotia. Primarily moderate deficits are forecast spanning southeastern Saskatchewan (SK) through southern Manitoba and well into Ontario, but more intense deficits are expected in a band across central Manitoba and in the northeast around Hudson Bay. In Alberta (AB), deficits will be severe to extreme in the upper and middle reaches of the Athabasca River watershed and extreme in the northern region of the province. Surpluses are forecast from Fort McMurray, AB to Churchill Lake, SK. Deficits ranging from moderate to extreme are forecast for much of British Columbia (BC) and may be intense in the northwest and around Prince George in the center of the province. Intense surpluses are forecast north of Kamloops and surpluses of varying intensity in a broken path down the eastern border. From December through February exceptional deficits will shrink in the east but persist around the Caniapiscau Reservoir in eastern Quebec (QC) and the Smallwood Reservoir in Labrador. Severe to extreme deficits will persist along the northern Ontario/Quebec border and east to Lake Mistassini. Conditions in the Prairie Provinces are expected to be similar to the forecast for the preceding three months with some downgrade in the intensity of deficits in the north. Deficits will remain intense in northern BC, downgrade in central BC, and intense surpluses will persist in the south around Kelowna. The forecast for the final three months – March through May – indicates normalization in northern QC, deficits stretching from Alberta through Nova Scotia, and surpluses emerging in eastern QC and in additional regions of BC. The British Columbia government declared a state of emergency in mid-August as officials conceded that rain is the only thing that could help the province deal with the hundreds of wildfires that have overwhelmed the province’s firefighting capacity and have cost over $200 million (USD $154 million) so far this year. The state of emergency was later extended to mid-September after 12,984 square kilometers (5,013 square miles) burned, beating the previous record set just last year. These last two fire seasons dwarfed the next worst from 1958, which burned 34 percent less area than what was scorched as of late August this year. Over 500 fires continued burning at the setting of the new record. Two First Nations governments in British Columbia have banned moose hunting in their territories since record wildfires have destroyed habitat area of an already-vulnerable population. This year has been Calgary, Alberta’s smokiest on record. The number of hours of smoky air in the city of over a million people reached 322 hours last month - beating the city’s record of 315 hours made just last year - as smoke from 550 fires in British Columbia blew in. The two consecutive record-breaking years are the highest since smoky air stats began in 1953. In additions to the better-known health effects of living in continually smoky conditions produced by wildfires such as breathing difficulties and heart conditions, Canadians are reporting an oppressive emotional toll as they spend less time outdoors exercising and socializing. A study published in the Canadian Journal of Public Health last year showed direct connection between living in smoky conditions and mental and emotional health. “Solastalgia” or “ecological grief” - grief experienced as people connect the wildfires to larger environmental issues - adds a unique fear of permanent loss and existential distress to the hardship of living day-to-day under darkened skies with degraded air quality. Witnesses to this year’s BC fires described “ash falling like snow” and afternoons as dark as night.